For all intents and purposes, until now, hot-in-place recycling has not played a significant role in pavement preservation throughout the country. Municipalities here and there have done a project here and there with mixed results over the past 20 years or so. That’s about to change. For the past year, a revolutionary advancement in the process has been gaining traction throughout the country. Agencies have been hearing about how they can recycle 100 percent of their existing pavements without having to add an overlay afterwards. Transportation decision-makers are learning they can do this for about 30 percent less cost, and public works officials are discovering that by using this new HIR process they can reduce their carbon footprint by 63 percent compared to traditional mill and overlay. This evolution in HIR technology is called Re-HEAT. Re-HEAT is a cost-efficient and environmentally-responsible alternative that will deliver comparable pavement longevity to mill and overlay. Re-HEAT is comprised of two pieces of equipment: A pre-heater and a heater/recycler. The total length of the pair is far less than other larger, less nimble HIR equipment options. The Re-HEAT operation is just over 80 feet long, allowing it to be used in municipal settings typically not feasible with other types of HIR equipment. 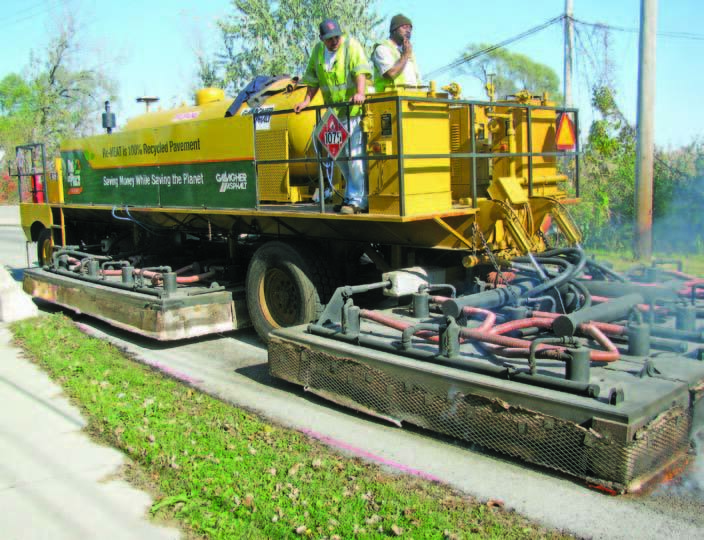 Re-HEAT begins with the pre-heater unit gradually heating the existing two to three inches of asphalt pavement to approximately 200 degrees Fahrenheit. The second unit, the heater/recycler, then continues to gradually bring the temperature of the pavement up to approximately 350 degrees Fahrenheit. Paddles underneath the unit begin to collect the heated and softened material into a windrow where it is fed into an on board asphalt drum mixer. In the horizontal drum mixer, the rejuvenating oil is uniformly applied and thoroughly mixed while the heating process is maintained within the drum. Less than a minute later, the recycled hot mix is distributed out of the drum onto the pavement where it is augured and put through a traditional asphalt paving screed. The paving screed ensures proper slope and grade is delivered to the final surface course. Immediately following the second unit is a traditional steel drum vibratory roller to achieve specified density. Minutes later, the road will be open to traffic. 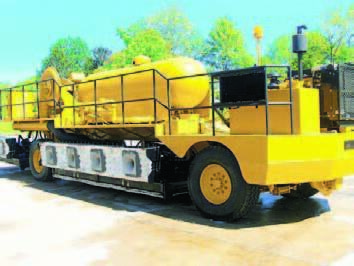 For so many municipality personnel who hear the Re-HEAT message, the response is, “This is a no-brainer.” Re-HEAT is currently under contract with or under serious consideration for use in this year’s pavement program by many respected, forward-thinking agencies throughout the country. Re-HEAT has successfully performed throughout the country, including in the cities of Chicago, Pittsburgh, Cleveland and a slew of other municipalities. In fact, after a pilot project last fall, the city of Chicago decided to incorporate it in a meaningful way into its resurfacing program for 2012. Milwaukee, Wis., and Marietta, Ga., will do the same. So will numerous counties in Georgia, Ohio, Tennessee and Indiana and suburbs in New England, Illinois and New Jersey — not to mention state DOTs in Rhode Island, New Jersey and Massachusetts. For further information about Re-HEAT and Gallagher Asphalt Corporation, visit www.hotinplacerecycling.com and www.gallagherasphalt.com, or contact the author, Pat Faster, at (708) 878-8783 or pfaster@gallagherasphalt.com.